Brazil's largest Carnival celebration) and sunny beaches. The charming city center in the Pelourinho district features museums, a vibrant music scene and stunning architecture. Chow down on Bahian food or settle into one of the bars dotting the coast, many of which feature live music. Head north beyond the city center for a more tranquil, local-frequented atmosphere. Take a day trip to nearby islands, beach towns and wildlife sanctuaries to explore the surrounding lush vegetation and rainforest. Salvador, the first colonial capital of Brazil, is located in the state of Bahia, which is famous for some of the best beaches in the world. 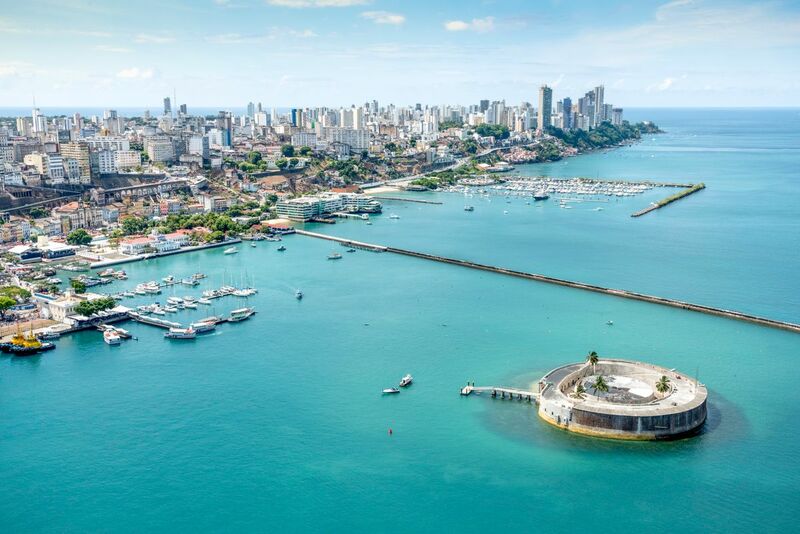 It’s also famous for the Afro-Brazilian culture; a result of the barrage of slaves shipped here in the 17th century, eventually claiming freedom in 1888. The city actually reminds me a lot of New Orleans: somewhat gritty, wonderfully colorful and bursting with music. We spent a day exploring the history of Salvador by starting at Mercado Modelo, where countless slaves first set foot in Brazil. After a quick walk through the Lower Town, we took Elevador Lacerda, which essentially dropped us in the middle of the historical center. We explored ornate churches and watched countless stages being set up for music festivals. (Keep in mind we were here just after Carnaval – the party really never stops.) We then lost ourselves in the colorful labyrinth of Pelourinho, beautiful alleys filled with cafes, bars and shops. Of course being in Bahia we had to spend a day at the beach so we headed to Porte de Barra, rented our chairs and plopped down. While we brought magazines and books, we really didn’t need them. First, caipirinhas, fried cheese, jewelry and massages were offered every few minutes. Then there were eclectic groups of friends and family applying oil and basking in the sun. There were even displays of capoeira, a Brazilian fighting style that looks more like dancing. But most importantly there was Footvolley. In this brilliant game players use their feet, chest and head to score points over a volleyball net. The sheer passion and talent of the players, as well as the hecklers, provided us with hours of entertainment. In our favorite part of Salvador, Rio Vermelho, we were lucky enough to meet several locals including Herbert, the self-proclaimed Frenchiest Brazilian ever. We peppered our new friend Dave, the manager of The Dubliner pub, with questions about the Portuguese language. We even engaged in lengthy political discussion with ex-pats and shared our love of San Francisco by singing Janis Joplin songs. While it’s true that the music here is constant, it’s the colorful people that truly are the heart and soul of this town. Living here several years. Knowing many places off the beaten tourist tracks. Working here as "Bahia Guide" (first link on google) AND enjoying the nice tropical life along the Atlantic Ocean. Center of Afro-Brazilian History and UNESCO World Heritage Site. Stay in Pelourinho at Casa do Amarelindo. Eat at Sorriso da Dada and order one of their famous seafood stews - Moqueca de Peixe. Pelourinho is the famous setting of many Jorge Amado books including "Dona Flor and Her Two Husbands" -- visit the museum dedicated to Amado right in the center of "Pelo." Visit the Church de Sao Francisco at the end of Anchieta Plaza, the interior is completely covered in gold leaf and one of the best examples of high-baroque architecture in the Americas. Stop by the famous Olodum drum school and listen to an impromptu performance by the young students. Leave a donation and then walk the many cobblestone streets which are lined with one the largest accumulation of colonial architecture from the seventeenth and eighteenth century. Enjoy the carefully prepared street food called Acaraje (deep fried bean fritter filled with shrimp) and buy wonderful handicrafts and the Mercado Modelo. Find out your fortune from a Mae de Santo at at Terreiro where the African Gods and Goddesses are still worshipped. And enjoy the music --- so much music! I didnt like to visit this city even knowing its one of the biggest and most important cities in Brazil. This is not an idea of how beautiful our country is, the only nice place is Praia do Forte about one hour away from Salvador.